Do Problems That Are Avoided Require No Solving? Recently, my granddaughter was at our house and she asked me if she could use the computer to print a resume′. I responded with a yes and then followed with the above quoted statements. The minute I said them, I thought to myself, “where did that come from?” I made the statements, yet I don’t remember having thought seriously about how the avoidance of a problem is easier than solving a problem. Of course, I am aware of statements like the one from Benjamin Franklin – “an ounce of precaution is worth a pound of cure.” Franklin’s statement is closely related to the one I made, but tends to be directed more to health problems. So, how can I put my statements together and have it as short and precise as Benjamin Franklin’s? “Problems that are avoided, require no time solving.” I think I like this last one. It’s definitely short and says no more, or no less than what I wanted to say to my granddaughter. 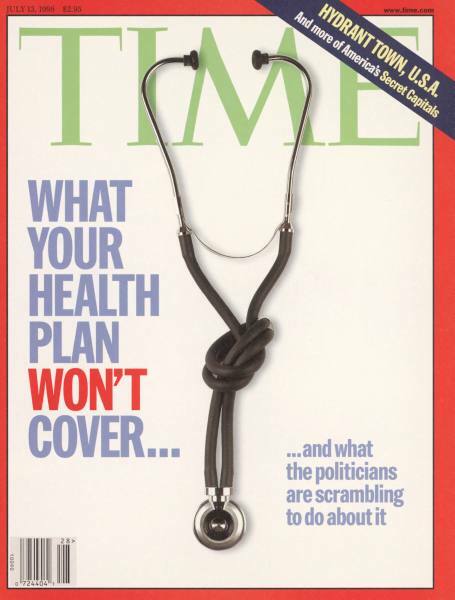 TIME cover 07-13-1998, knotted stethoscope used to symbolize problems in the health care industry. “Problems that are avoided, require no time solving.” Is the statement true? Absolutely – we don’t have to solve a problem that doesn’t exist, or do we? Is there ever a situation where we solve problems that don’t exist? I don’t know about you, but I’ll admit that I do worry sometimes about problems that don’t exist, and yes, I spend time thinking about their solutions. In fact, now that I think more about it, I have spent a lot of time solving problems that don’t exist. For example, last Summer I was concerned about what to do if a hurricane would threaten our vacation on Hilton Head Island. I, in my mind, began solving the problem by considering where we would stay inland and “ride the storm out.” Keep in mind, at the time I was solving the problem, the only hurricane that existed was in the Pacific Ocean and Hilton Head Island is in the Atlantic. What was I thinking?!!! Ok, so should we spend time solving problems that don’t exist? No, if it is a problem as exemplified in the previous paragraph. But, yes, in the spirit of using our thinking to imagine implications and consequences of actions that we might take both physically and mentally. In that sense, we might be wise to spend time solving the different problems that we imagine in order to see which action(s) we should take. An example of this kind of problem-solving is experienced when we play chess. Another example is when we have a “brain-storming” session. What do you think about avoiding problems instead of solving them? This entry was posted on Thursday, November 5th, 2009 at 1:00 am and is filed under R2, Ron Rogers, self-improvement, Writing for learning. You can follow any responses to this entry through the RSS 2.0 feed. You can leave a response, or trackback from your own site. One Response to Do Problems That Are Avoided Require No Solving?